This is a guest blog by Jody Smith, Product Manager at Broadsign. Around the world, smart city projects are popping up with unique solutions to longstanding urban challenges. Some examples include streetlights that analyse the current traffic situation, maps that indicate available parking spaces and street kiosks that deliver city information in real time. These IoT devices and data feeds are the brains of a smart city, helping to acquire data, promote efficiency, and generate revenue for the governments. People, though, are at the heart of these projects, as the ultimate goal of a smart city is to better the lives of citizens. To that end, cities are embracing technologies that entertain, inform and secure their citizens. This is done by connecting city infrastructure with personal devices such as mobile phones, connected cars and smart homes, as well as through digital signage. These digital signs are a key element of smart cities, as they are an efficient and interactive way to display relevant and timely information to the mass population. Digital screens also play a role in financing smart cities, with out-of-home ad revenue being the main way cities alleviate the hefty costs that come with the smart city infrastructure. We might imagine these screens being fully run by the public sector, with governments and city services taking the brunt of the workload. However, partnerships between the public and private sector have proven to be an ideal fit for setting up, maintaining and financing smart city screens. A few examples include Intersection’s LinkNYC project, where kiosks provide free wifi, municipal information, wayfinding and more to residents and visitors across the city, and JCDecaux’s smart bus shelters in Paris, where real-time traffic information is available to keep passengers informed. And this is where your digital signage network fits into the smart cities formula. The screens that are traditionally considered part of smart cities are those in public spaces, yet those in the private sector can also be considered. Any screen that is part of the IoT has the potential to inform, entertain and better the lives of citizens. So whether your screens line the busiest streets of the city, or the halls of a mall or campus, your network should get ready for the smart cities revolution. To do so, here are a few things your network and screens should be able to do. Ideally, digital signage screens should be able to connect with other IoT devices outside of themselves, like mobile phones, POS systems, analytics software, USB charging stations and more. For this reason, it’s common to see smart city networks built atop easily extensible platforms like Ubuntu. Built on an open standard that has attracted millions of developers around the world, this type of platform is compatible with digital signage players and other IoT devices used in smart city projects of all kinds. If your network is small, it may not be necessary to connect to countless technologies, however planning for growth is important when considering how your network fits into the smart city revolution. Thinking of ways technologies will improve communication and interaction between your network, your audience and the smart infrastructure not only now but in the future will be key to your network’s success. Technology can’t really be smart without data. Live feeds, audience analytics and viewer interaction should be used to keep screen content interesting, timely and relevant to the audience. Healthcare networks can use current wait times to inform patients, malls can use facial analytics to suggest relevant stores for each shopper, and outdoor screens can display searchable maps of available parking spaces. Today, leading digital signage platforms, like Broadsign, are built with dynamic content in mind. Abandoning playlists for rules-based delivery and offering easy integration of outside data streams, they allow digital signage to be flexible enough to adapt messaging to every industry and situation. On the flip side, for a truly smart network, you should also be able to gather usage data to improve infrastructure, determine what services to add, or what product offerings to extend. At a base level, this data should be made available to employees to manually analyse. However, an even smarter solution would connect with other systems and devices to adjust on the fly. Have hundreds of people searched for a particular item on tablets in a retail store, only to see none are available? This is a sign that inventory is far outmatched by demand, and the system can automatically suggest higher stock going forward. With the number of devices involved and the amount of data being shared between them, security is a top priority for smart cities. Reliability is also key, as many citizens will come to rely on these services for their daily commutes, health needs, city tours and more. Seeing as screens are front and center in most smart cities, ensuring your digital signage software, hardware and applications are protected and secure is extremely important. Generally, the smarter the network, the more expensive it is. As a network becomes more dynamic and data-driven, more technologies are necessary. This is especially true for massive smart city installations, as a variety of software, hardware and machine learning components are necessary to harness the true benefits of smart cities. 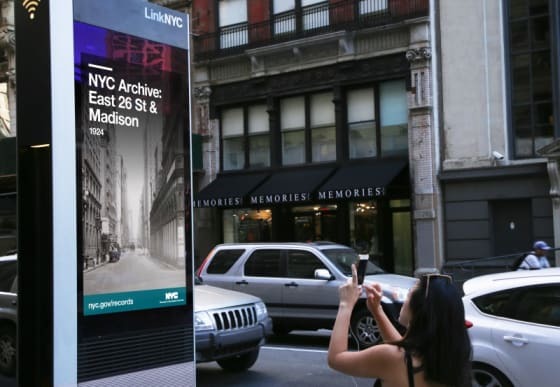 LinkNYC, for example, is set to generate more than $500 million in ad revenue for the city in just over a decade. This enables them to fund a variety of projects, without New Yorkers feeling the weight of the investments. As big data, VR, AI, IoT and the cloud continue to technological advancements, the viability of smart cities rises. Cities around the world are embracing smart technology to better urban life, and digital signage networks can definitely get in on the action.